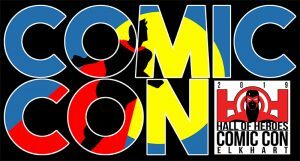 The 2019 Hall of Heroes Comic Con Elkhart will be held September 7th & 8th, 2019 - and this year we're heading north! This year's con will be held at the new Center Six One Five event center on the north side of Elkhart at the corner of County Road 6 and County Road 15. Celebrity and artist guests and event pricing will be announced soon. Check back here or at the con's website at http://hohcomiccon.org/ for more information.